LIVING a legally non-existent life for more than six decades, the Taungya forest-dwellers in Gorakhpur and Maharajganj districts of Uttar Pradesh finally got their share of rights on forestland. On July 25, state forest minister Fateh Bahadur Singh distributed land titles to 651 Taungya families in six villages of the two districts under Forest Rights Act (FRA), 2006. Taungyas were hired by the forest department as bonded labourers to plant trees in degraded forests of Uttar Pradesh during the British rule. But later, they were branded illegal forest-settlers. Neither the forest department, nor the revenue department recognised them. But the FRA promises the rights of forest-dwellers on the forestland and resources they traditionally use (See ‘Disowned 100,000’, Down To Earth, May 31, 2011). In 2009, more than 4,500 Taungya families of Gorakhpur and Maharajganj filed claims for ownership of the land they were living on. After much reluctance, the government finally started accepting these claims. On July 25, 147 titles were distributed in Bharivaisee village of Maharajganj, while 504 titles were distributed in five forest villages of Gorakhpur district— Tilkunia (212), Rajeji Camp (85), Rajehi Khale (47), Aambagh (101) and Chillwa (59). The applications of 17 Taungya villages in Maharajganj are being processed and land titles may soon be distributed. Applications for community rights over the forestland are also being considered. The fight for getting their rights recognised has not been easy for Taungyas. Initially, the government rejected their claims on the ground that they have not lived in forests for 75 years. To claim land ownership a non-tribal must have lived in forests for at least 75 years prior to 2005. Taungyas have always been on the move and do not have records to show this. It was only after huge protests put by the Taungyas that the government agreed to consider their claims. “We have been promised that the process of converting Taungya settlements into revenue villages will start soon,” says Vinod Tiwari of Vikalp, a Gorakhpur-based non-profit that spearheaded the fight for Taungya’s rights. Uttar Pradesh has now become the first state to grant land titles to Taungyas. “This was possible because of people’s relentless efforts. The example set by Uttar Pradesh should be followed by other states like Assam and north Bengal that have a large number of Taungyas,” says Roma of National Forum of Forest People and Forest Workers (Kaimur). 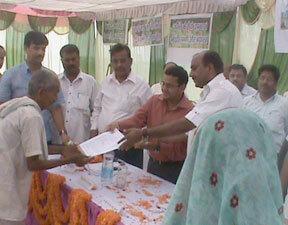 She is also a member of the Uttar Pradesh FRA implementation monitoring committee.